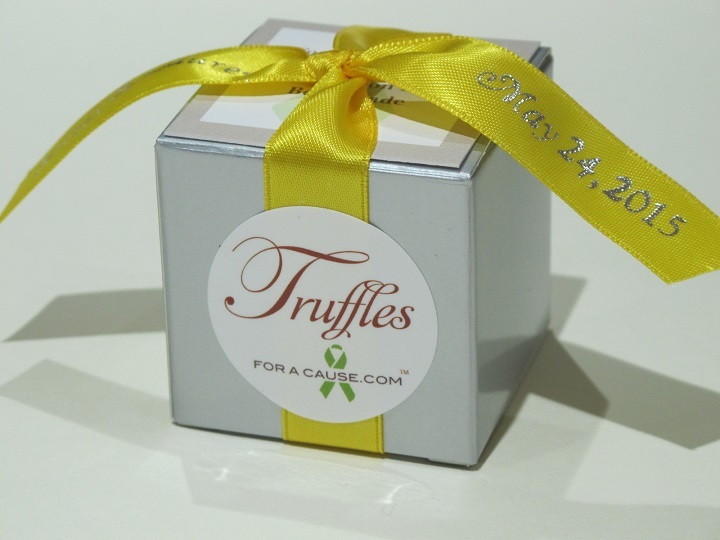 Wedding Favors & Event Favors that Bring Awareness to Causes that Matter. Margaret requested “silver” boxes with lemon colored ribbons for her daughter Lauren’s favors. We don’t usually offer our single piece boxes in silver but we made an exception for Margaret. Her charity was Alzheimer’s Association (www.alz.org), with a very touching personal mention – “A special donation has been given in loving memory of Lauren’s Grandmother.” Alzheimer’s is a disease that attacks the brain. It is the most common form of dementia. The Alzheimer’s Association mission is to eliminate Alzheimer’s disease through the advancement of research and to reduce the risk of dementia through the promotion of brain health. Thank you Margaret and good luck to Lauren & Jeffery! Last May Emily & Matthew’s favors were our Foil Favors with dark (silver), and milk (gold), chocolate foil truffles in beautiful clear favor boxes. 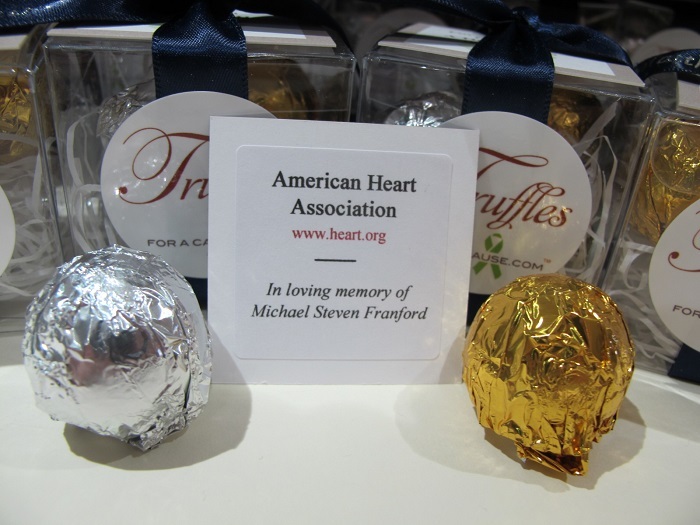 Their charity was the American Heart Association (AHA), (www.heart.org), with a touching personal mention. The American Heart Association is a non-profit organization in the United States that fosters appropriate cardiac care in an effort to reduce disability and deaths caused by cardiovascular disease and stroke. They have been working to save and improve lives for more than 90 years with scientific research at the core of all their efforts. A history and background of AHA is covered in one of our previous stories – check it out. Thanks and hope you and Matt are doing great! 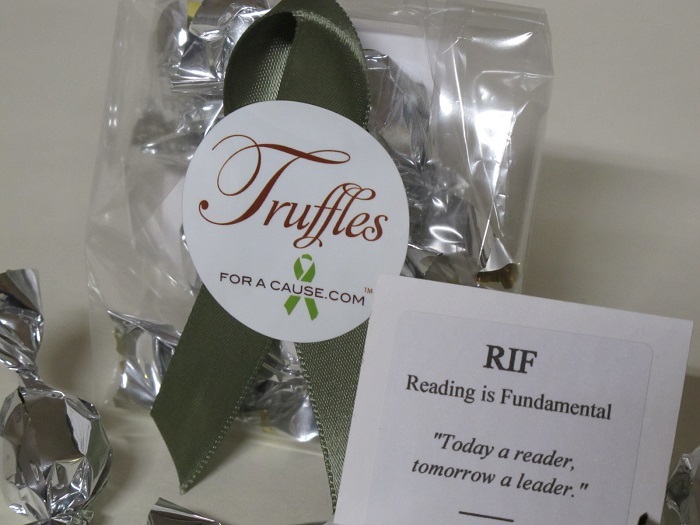 Reading Is Fundamental (RIF), was the charity that Suzanne chose for her favors for her daughter’s bridal shower. They were silver minis tied with deep sage ribbons. Thank you Suzanne! 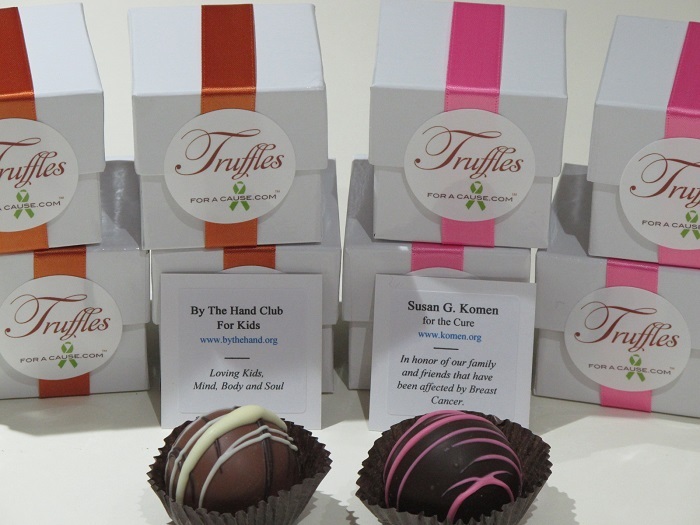 “Just wanted to let you know how pleased I was with my order placed for truffles for my daughter’s bridal shower. The ordering process was very easy, the delivery prompt and perfectly packaged. 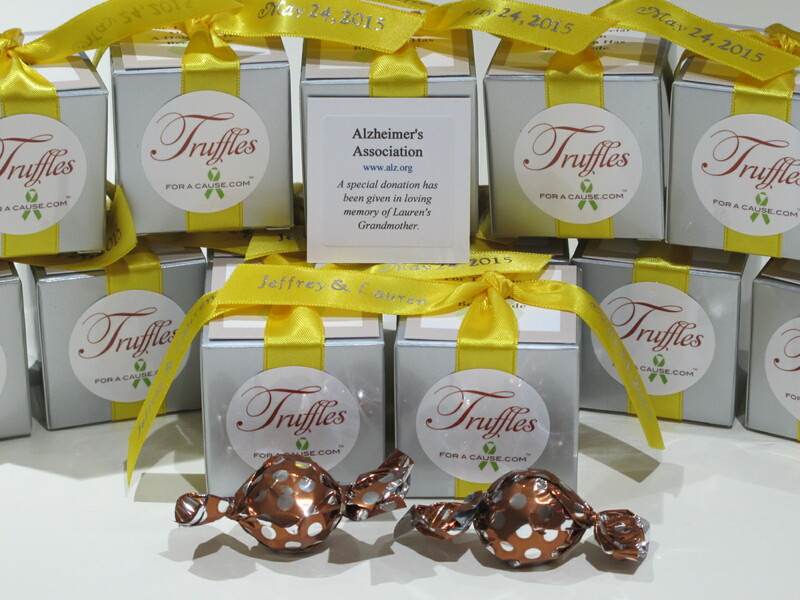 They were a big hit at the shower, all the people were impressed and most of all the truffles were delicious! I would highly recommended to all my friends, thanks.” Suzanne. Reading Is Fundamental (RIF), brings the joy of reading and learning to children in need of support across the country. With the help of thousands of RIF volunteers and local established chapters throughout the country in schools, Head Start programs, community centers, health clinics, migrant camps, and homeless shelters, we provide books and supporting literacy resources to reach children wherever they are in need. 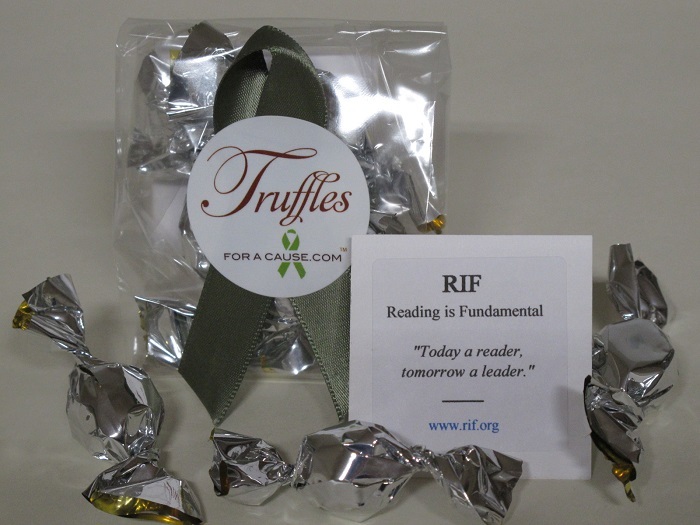 To learn more about RIF visit their website. 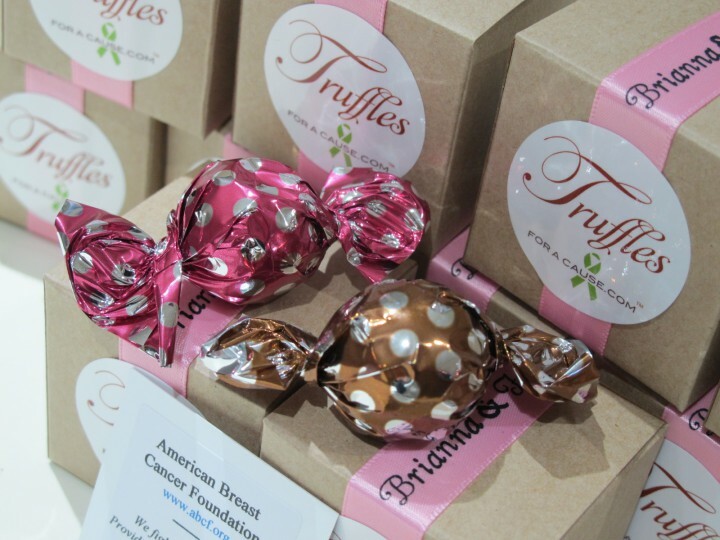 Caramel milk chocolate and raspberry milk chocolate twist truffles were the perfect choice for Brianna & Frank’s wedding favors. 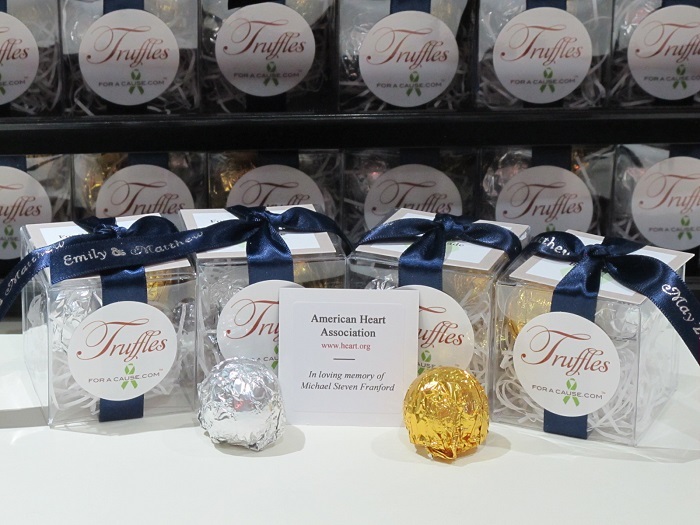 Our caramel twist truffles is one of our most favorite truffle flavors. It is at the center of the truffle chocolate cream ganache center. Brianna & Frank’s charity of choice was a donation to the American Breast Cancer Foundation with a special mention on their charity card – “We fight for everyone. 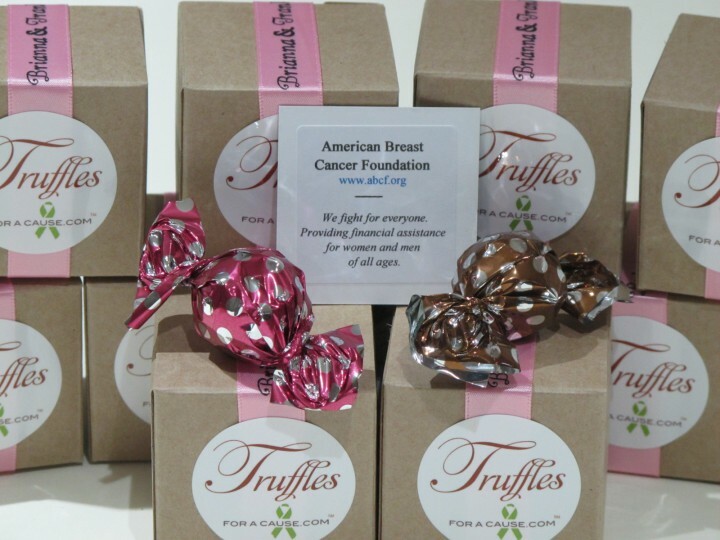 Providing financial assistance for women and men of all ages.” Their printed ribbons are pink wrapped around (modern style), on our natural kraft colored favor boxes. Thanks to Brianna & Frank – Good luck and Congratulations! 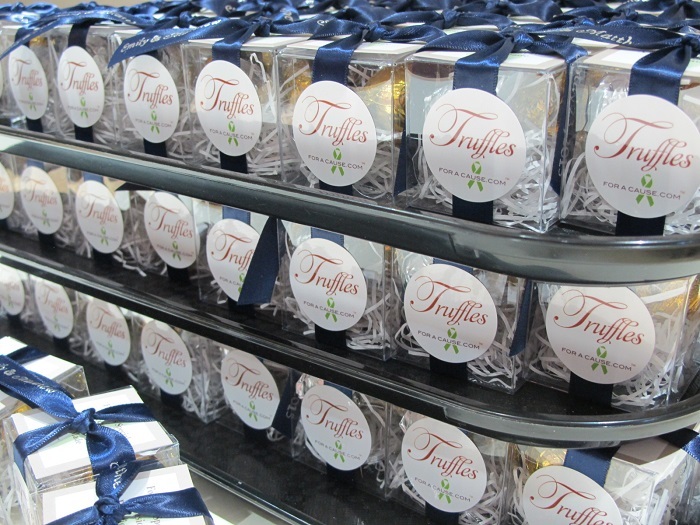 These Dessert party favors were for Providence bank employee’s Christmas party. Corporate party favors are on the rise. They are a perfect addition to a company event (party, meeting or special corporate dinners, etc.). For the Providence Bank Christmas company party they wanted to have two cards for each of their two charities – one for the dark chocolate raspberry truffles and one for the milk chocolate caramel truffles. 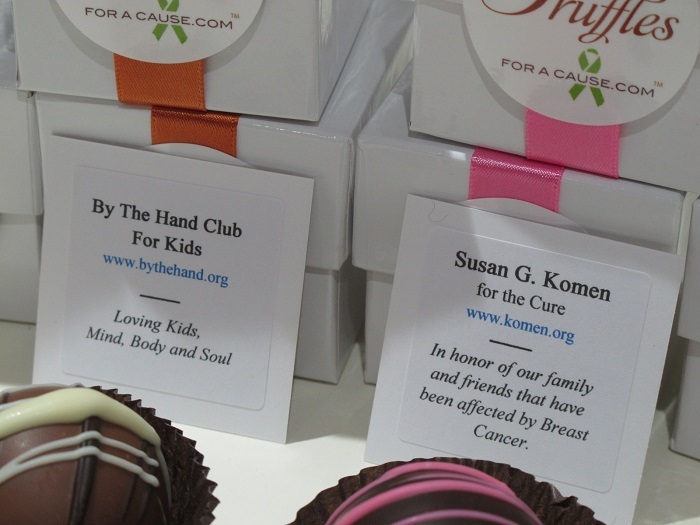 The charities were Susan G. Komen and By The Hand Club For Kids – both fantastic charities. The ribbons were hot pink and burnt sienna tied in our “modern” style version of our favors.